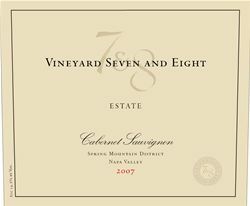 Vineyard 7 & 8 is a reflection of the uncompromising pursuit of producing premium, handcrafted wines highlighting a sense of place within the Spring Mountain District of the Napa Valley through experience, passion and humility. Nestled 2020 feet above the valley floor atop Spring Mountain, the estate that has become Vineyard 7 & 8 is owned and managed by the Steffens family. A quest that began with a patient and measured search for a vineyard property in the Napa Valley that met the family’s specific requirement of being an already established vineyard, or land with outstanding potential for growing premium grapes, bore fruit in 1999 when the family acquired the forty-acre property on Spring Mountain, planted in the early 1980s to eight acres each of Cabernet Sauvignon and Chardonnay. The winery is named in recognition of proprietor Launny Steffens’ life and background in the world of finance. An appreciation for numerics and a keen interest in numerology lead to 7 & 8 - “Seven” being a number of luck in western culture, while “Eight” carries the meanings of prosperity and happiness in eastern culture. Vineyard 7 & 8 is located at 4028 Spring Mountain Road in St. Helena, California. Tastings are scheduled by prior appointment. Additional information is available by visiting www.vineyard7and8.com or by calling the winery directly at (707) 963-9425. Our goal through a curated visit to the estate is to show you an in-depth, intimate look at how we craft our wines, tend to the vineyard and privately present our wines with a seated tasting in our great room overlooking the vineyards. Vineyard 7 & 8 is certified under the Napa Green Winery Program by the Napa County Department of Environmental Management (DEM) and the Association of Bay Area Government’s (ABAG) Green Business Program and completed all the regulatory components needed for environmental sustainability. These components included developing water and energy conservation methods, preventing pollution, and reducing solid waste. In addition to developing sustainable winery practices, this program is set to become the standard for the state of California. Vineyard 7 & 8 is certified under the Napa Green Certified Land Program. Vineyard 7 & 8 has created and implemented a customized farm plan with measured results that addressed all aspects of its property, vineyard land as well as non-farmed land, including practicing soil conservation, water conservation, stable drainage, riparian corridor enhancement, fisheries and wildlife habitat enhancement and long-term improvement and sustainability.